Avon resident Jessica O’Hanlon (fourth from right) is a member of the Red Bank Roller Vixens. Photo by John Keoni for the Red Bank Roller Vixens. Kim Predham does not think of herself as an athlete. Those hours of roller-skating were put to good use. Now, at 32, the Asbury Park resident is a local version of a roller derby queen, as is her teammate, Jessica O’Hanlon, 37, of Avon. O’Hanlon, skating under the name Anna Stesia because she is a registered nurse, and Predham, who goes by Infra Red because of her red hair, are two of about a dozen skaters for the Red Bank Roller Vixens. They are part of a 21st Century resurgence in roller derby, a popular mid-20th Century sport. Basically, skaters go around a track in a counter-clockwise direction during jams. Jammers, such as Predham, score by lapping members of the opposing team, while blockers, such as O’Hanlon, block out opposing team members while helping along their jammer. The Roller Vixens skate flat-track at their home at the Tab Ramos Sports Center in Aberdeen. 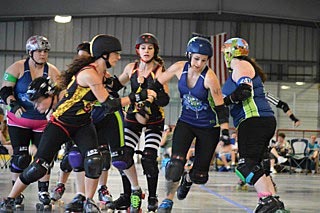 The Roller Vixens season began in March and runs to November. The Roller Vixens’ next game is against the Atlantic Coast Roller Girls on Saturday, Oct. 4, at 8 p.m. at Tab Ramos. About two years ago, O’Hanlon saw a notice about roller derby and checked into it. “A lot of us are career people with kids,” said O’Hanlon, who is single and has a son, Gavin, 14. Gavin attends games and, according to O’Hanlon, players’ children are quite involved, doing things such as selling tickets and setting up. Adrienne Didik, a friend of Predham’s who came up with the Infra Red name, said she has been to several bouts in which Predham has skated. Predham has been involved with roller derby “on and off for eight years,” she said. Predham eventually began skating with the Hub City Hellrazors, based in the New Brunswick area. Predham finds a variety of things attractive with the sport. “I like the camaraderie,” Predham said. “I really love my team. They’re a really good group of women. It seems everybody is just there for one another. “I like the rough-and-tumbleness of it,” said Predham, who is 5 feet 2 inches and weighs 125 pounds. “I like yoga, but it does not give me the satisfaction of going out there, knocking somebody down. And there is the charitable aspect. “It appeals to me that we are able to give back,” said O’Hanlon, saying the team has contributed such causes as children-victims of domestic violence, junenile diabetes and the humane treatment of animals. “I meet great people and raise money for charitable events,” O’Hanlon said. Some of the proceeds from the Oct. 4 game will go to the Making Strides Against Breast Cancer fund-raising walk. As personnel changes on the Roller Vixens, the ages of skaters range from the mid-20s to the early 50s, according to Predham and O’Hanlon. As for the skaters’ careers, Predham said “they’re all over the map”: hairstylist, telecommunications manager, special education teacher, newspaper advertising salesperson. O’Hanlon said roller derby has a diverse group of women. “It’s a huge time commitment for everyone involved, so it’s great to see all the hard work and practice come together at each bout,” Didik said. “Any stigma put to roller derby is easily put to rest,” O’Hanlon said. “I can’t imagine my life without derby,” Predham said. Information on the Red Bank Roller Vixens women’s roller derby team is available from Kim Predham at telephone 908-309-9228 or e-mail rbrvmarketing@gmail.com. Women 18 and older can join the Roller Vixens. A special email for recruiting is vixensrecruiting@yahoo.com. Posted in Shore Communities and tagged Asbury Park, Avon, Joe Sapia.